Arizona Coyotes star winger Max Domi is beloved for many reasons, not the least of which is his fearlessness. Unfortunately for Coyotes fans, for the past two months, Max Domi has not been able to shine on the ice with Arizona. Domi’s absence was yet another blow for the Coyotes, looking to make a step forward this year with its youth and smart signings. During this season he has had success as Domi has five goals and ranks second amongst Coyotes with 16 points while averaging 17:16 a night in ice time in 26 games this season. He, like his father before him also saw some time in the sin bin as his last fight on the ice marked his sixth career regular season fight. Max’s father, Tie Domi, owns the NHL record for most fights in a career after dropping the gloves 338 times in 1,020 games. Whether Max will come close to this number is yet to be seen but given his track record it would seem that Max may not have the same scrappy gene that his father made famous during his time in the NHL. It’s been since December, 8th that the franchise forward last saw the ice in an NHL game and through 26 games he has five goals and 16 points in points, just behind right winger Radim Vrbata. He also has 11 blocks 18 hits and 22 PIMs. For fans and teammates alike this has been a long road without their young winger and his long awaited return is much welcome given the Coyotes’ standings in the Pacific. Domi, The 2013 first-round pick scored 18 goals and added 34 assists in 81 games with the Coyotes last season and the Coyotes’ hope to see great numbers from him moving forward this season. Whether or not he returns in full goal scoring form remains unseen, but the team and fans remain hopeful that their star sophomore returns with full force and stays healthy for the remainder of the season with the Coyotes. The Internet is flooded with authentic autographed hockey jerseys. A simple Google search unleashes thousands of results. That’s why we created the Autograph Network, your official home for autographed Max Domi and Tie Domi merchandise. We have a great selection of high-quality Max Domi memorabilia, direct from Max himself. We sell photos, caps, sticks and pucks autographed by Max Domi. The most popular item we sell are Max Domi jerseys. Max’s career is still young, but we stock a wide range of jerseys that chronicle his journey. Max established himself as a nationally known name through his play on Team Canada in recent international tournaments. 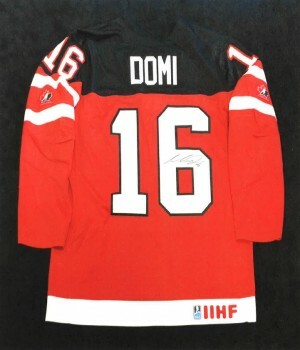 We have both red and white Max Domi Team Canada jerseys, each donning his number 16. Get ready, we will have official London Knights jerseys arriving shortly. Max first made a name for himself playing for the storied OHL franchise, making some impressive playoff runs during his tenure. In addition to autographed Max Domi jerseys, we have a lot of other great memorabilia items from Max’s career. We have a great selection of high-quality official photographs autographed by Max including shots from Team Canada, his first NHL goal against the Toronto Maple Leafs, Max’s first NHL hat trick and various other photos from Max Domi’s career. Photographs are professionally framed and some contain authentic game used items. You can also purchase unframed photos and non-autographed photographs. We also have a great selection of Tie Domi unframed photos to add to your hockey memorabilia collection, perfect for any Leafs fan on your shopping list. Another popular item is our selection of autographed Nike 100th Anniversary Team Canada caps autographed by Max Domi. We have both black and red hats in stock. We also have pucks autographed by Max. Choose between an official puck from the 2015 IIHF World Junior Tournament or an Arizona Coyotes puck. We’re also excited to let you know that hockey sticks autographed by Max will be coming soon. Like you, we are excited to see what’s next in Max Domi’s hockey career and we are your official source for autographed Max Domi jerseys and other memorabilia. Own a piece of this journey by purchasing your jersey. All jerseys can be securely purchased online using all major credit cards and are safely shipped worldwide by Pak Mail. Sports memorabilia collecting is a great hobby and it can also be profitable. Collecting signed jerseys of an up-and-coming athlete is an excellent way to build a collection that will hold value for years to come. 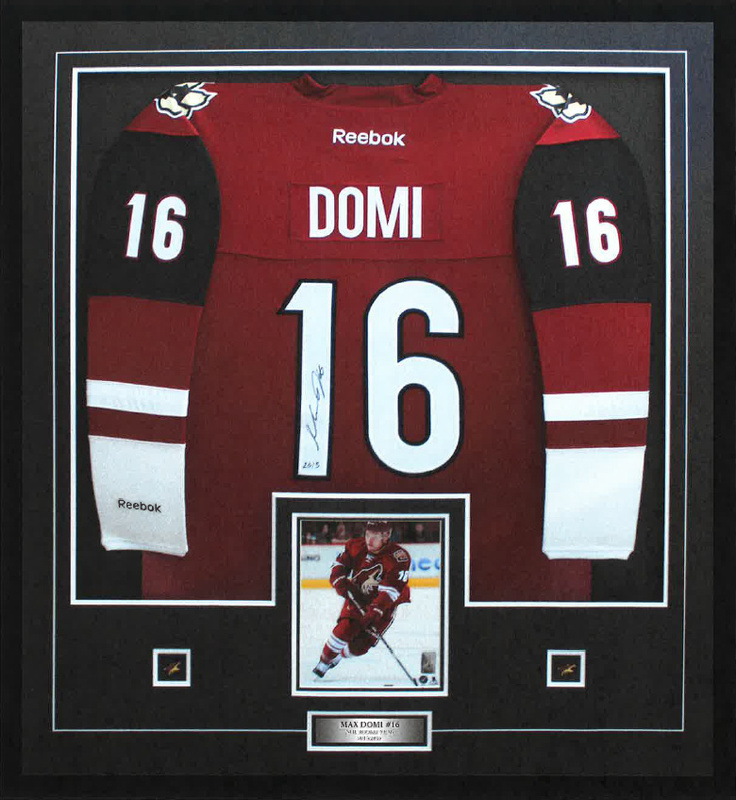 At the Autograph Network, we are the official home of memorabilia signed by Arizona Coyotes superstar Max Domi. Our website is full of autographed jerseys, framed photos, caps, sticks and pucks. All of our autographs are in excellent condition. Max Domi grew up as the son of famous NHL enforcer Tie Domi. Growing up in Toronto he was surrounded by some the game’s best players. It didn’t take long before Max carved out his own niche in the hockey world. Off the ice, Max is a role model for many people living with diabetes. He, himself was diagnosed with Type 1 Diabetes at the age of 12. We have a great selection of autographed jerseys that chronicle Max Domi’s early, yet impressive career. Max Domi made his OHL debut with the London Knights on September 23rd, 2011 with a hat trick. It was a great year for Max, his Knights would finish the season by winning the 2012 OHL Championship. Max caught the attention of many NHL scouts by the time year finished. Overall, Max Domi would spend four seasons with the Knights. During this time he tallied 331 points for a dominate London team. Max Domi and his Team Canada teammates were the pride of Canada during the 2015 World Junior Ice Hockey Championship. The team featuring Domi along with Connor McDavid, Nicolas Petan and Sam Reinhart would win gold in a thrilling game against Russia. The entire hockey world took notice as Max Domi notched a goal and put up two assists. Max would finish the tournament with 10 points. Max represented Canada in the following year’s 2016 IIHF World Championship. He played a key role for a Team Canada that would eventually leave Russia with gold. We have some excellent Team Canada jerseys autographed by Max Domi for sale this website. A great collector’s item for any sports fan. Max Domi’s performance for the London Knights and Team Canada earned him a ticket to the NHL. During the 2013 NHL Entry Draft, the Arizona Coyotes selected Max Domi with their 12th overall pick. He would eventually join the team full-time for the 2015-2016 NHL season. During his rookie year, Max tallied a total of 52 points with 18 goals. He earned a reputation around the league for playing with speed, passion and grit. The Gila River Arena is regularly filled with fans proudly wearing Max’s number 16 Coyotes jersey. He began wearing number 16 when he was younger in tribute to Bobby Clarke, a Hall of Fame player who was also a star in the league while being a diabetic. We are your source for autographed Max Domi Arizona Coyotes jerseys. All jerseys can be securely purchased online using all major credit cards and are shipped worldwide by Pak Mail. This is an exciting time to be a Max Domi fan. His rookie campaign in the NHL created a lot of buzz in Arizona and throughout the league. Max is a role model both on and off the ice and his career has only started. Own a piece of Max’s impressive legacy by purchasing an autographed jersey. Please let us know if you have any questions or requests related to Max Domi autographed jerseys and official merchandise.